Note: Sidewheel measured 22' diameter. Niagara Harbor & Dock Co.
Sunk in St. Clair Flats, appeared broken in two. Declared a total wreck Mar 13, 1860. Machinery into G.W. REYNOLDS, 1864. 1837, Jul 21 Maiden trip, sailed between Toronto, ONT & Hamilton, ONT. 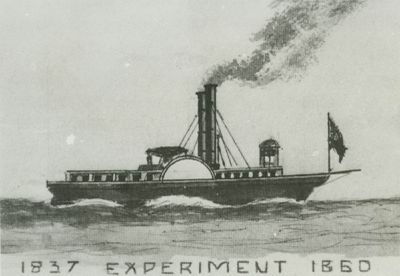 1838, Jun 21 Owned Canadian Government; renamed HMS EXPERIMENT. Patrolled Lake Ontario & St. Lawrence River. 1838, Nov 11-12 Intercepted & destroyed pilothouse of steamer UNITED STATES. 1846, Aug 11 Owned unknown parties. 1847 98 x 15.6 x 7'; 100 tons. 1847, Apr 11 Owned T. Waters, Port Dover, ONT. 1847, May 26 Ran between Buffalo, NY & Port Dover, ONT. 1848 Summer Ran between Buffalo, NY & Port Stanley, ONT. 1848, Oct 2 Struck snag while entering Black River, MI; returned Buffalo for repair. 1850 - 51 Ran between Buffalo & Dunnville, ONT. 1854 Owned Port Dover parties. 1858, Jul Collided with unknown propeller near Mammy Judy Island. 1858, Dec 3 Seized Wallaceburg, ONT for violation of revenue laws. 1859, Nov 11 Sunk St. Clair Flats, MI.